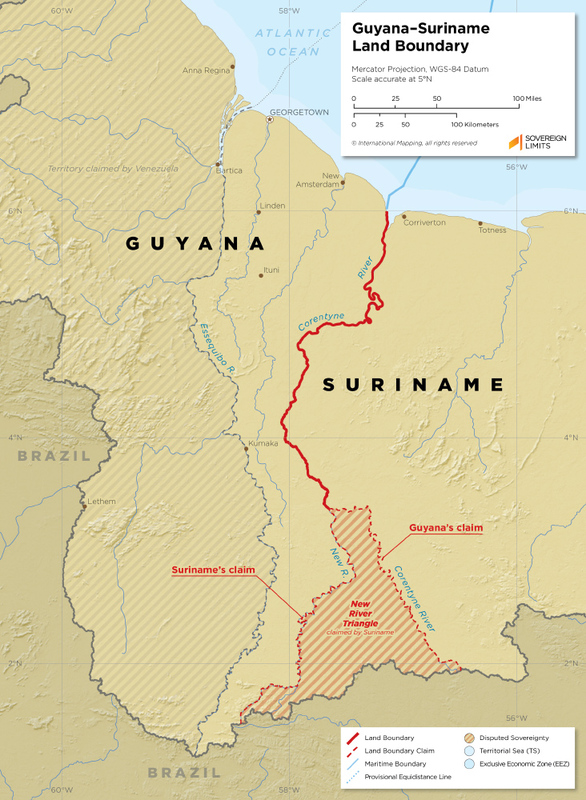 The boundary between Guyana and Suriname follows a series of rivers through isolated rainforests and extends through some of the most sparsely populated regions in the world. An operative boundary was established by the British and Dutch colonial powers but very little was ever formally agreed on due to a number of disputes. The northern section of the boundary was first established during the late 18th century and was said to follow the western bank of the Courantyne River. However, Great Britain, and later independent Guyana, claimed the thalweg of the river as the boundary. In 2007, as part of a maritime arbitration, the border was determined to fall along the western coast of the river and is no longer disputed by Guyana. The remaining dispute, known as the New River Triangle, stems from the question over which tributary is the source of the Courantyne River. The British claimed the boundary followed the Kutari River while the Dutch claimed the New River. Guyana and Suriname have not resolved this dispute.